In 1898, Radium, a highly radioactive element was discovered by Maria Curie and her husband Pierre. The extreme dangers of radiation were not yet known and the intensely radioactive Radium compounds were made into a wide variety of elixirs and potions for treatment of whatever ailed you. Manufacturers claimed that Radium could cure just about anything - when in reality, it actually wound up causing the most horrible deformities, cancers and long, drawn out deaths of the those who ingested it. 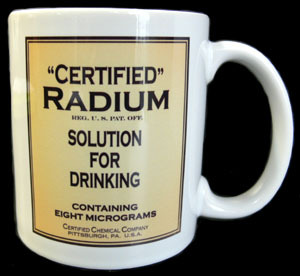 Our 'Radium' coffee mug is a reprint of an actual label from one of the more popular products of the time. 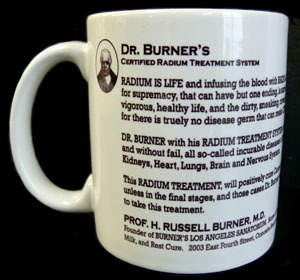 "Dr. Burner's Certified Radium - Solution for Drinking" was claimed to positively cure Cancer and all other incurable diseases. Although it's difficult to believe that such a product could ever have been sold, it makes a great conversation piece and a fine addition to that unique mug collection of yours. Like all our mugs, this one is printed in color, on a high gloss, 12 ounce ceramic coffee mug. Dishwasher safe of course.